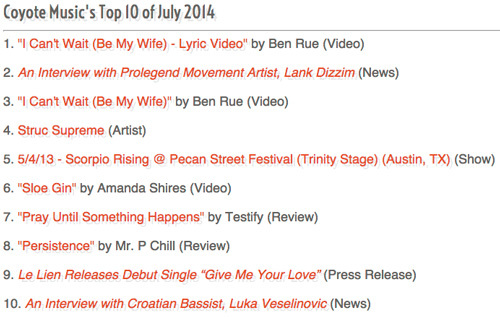 The Top 10 most visited pages on CoyoteMusic.com in July 2014! 1. "I Can't Wait" (Be My Wife) - Lyric Video" - Ben Rue released the official video for his smash single in June 2014 but folks apparently can't get enough of the lyric video, posted to YouTube on March 10, 2014. In either case, it's the unrivaled wedding song of 2014. 2. An Interview with Prolegend Movement Artist, Lank Dizzim - This summer, fans can't get enough of our April 2013 interview with Lank Dizzim. Our Q&A made the Top 10 last month and this month. Time will tell if it keeps up the pace in August. 3. "I Can't Wait" (Be My Wife)" - Though his lyric video took the #1 spot, our website's servers went nuts when we posted Ben Rue's debut video, shortly after its official release. 4. Scorpio Rising @ Pecan Street Festival (Austin, TX) - Copy/Paste from last month. Not kidding. Skip ahead if this sounds familiar: Not exactly sure why this year-old gig attracted so many people, except that they may have been looking for information on this year's Pecan Street Festival and got lost. 5. Struc Supreme - Atlanta rapper Struc Supreme brings it hard, making it into our Top 10 despite his appearing on our site very late in the month. Worth checking out for all Hip-Hop fans, especially those into Dirty South artists. 6. "Sloe Gin" by Amanda Shires - Amanda Shires' sultry video stepped out of our Top 10 after making it in for two straight months. Well, sheeeeee's baaaaaack! 7. "Pray Until Something Happens" by Testify - Christian rapper Testify impressed with his latest album (aka "P.U.S.H."). Check out our take on the album. 8. "Persistence" by Mr. P Chill - Mr. P Chill spent the month of June touring the entire country—literally, he drove from Sacramento to NYC! His fans across the country have checked out our take on this old school Hip-Hop album that exemplifies why Chill's been in the game for so long. 9. "Tramp Stamp" by HER - Nashville's HER made a pretty fun indie-artist video, conveying their light-hearted song's message on a reasonable budget. NOTE: In a first-time occurrence, between writing time and publishing time, there was a change in the Top 10. Our press release announcing the release of Le Lien's single "Give Me Your Love" jumped into the #9 spot. Props to Le for the photo finish. 10. An Interview with Croatian Bassist, Luka Veselinovic - The Veselino Jazz Project continues to bring in readers from around the world. There's something really compelling about Luka's story: born and raised in Croatia, then schooled at Berklee School of Music, then returned to his homeland to put his skills on display. If you haven't read about Luka yet, what are you waiting for?